We are currently screening and assaying roots of invasive and native plants for phenolic oxidase and peroxidase enzymes. Phenolic compounds are allelopathic signal molecules exuded by the roots of many plants and detected by the roots of other plants. Invasive plants – plants that often were introduced from far-away regions – may not respond appropriately to these coevolved interspecies signals. Root enzymes that destroy phenolic compounds may be involved in the process of permitting an invasive plant to (a) ignore the signal molecules exuded by plants in the native community and (b) to render such allelopathic compounds ineffective. We have identified invasive grasses that appear to have strong polyphenol oxidase activity. Using qualitative assays we are now screening a wide taxonomic range of grass species for phenolic oxidase activity. Using quantitative assays we focus on the grass genus Bromus by comparing native and non-native species. Species from that genus are known to be problematic invaders in many parts of North America; there are several non-native Bromus species in the Hackensack Meadowlands. Phenolics degrading enzymes have broad specificity. Phenolase and laccase, enzymes widely distributed in the plant kingdom, have been shown capable of degrading chlorophenols and other xenobiotic phenolics. Phytoremediation of xenobiotic chlorophenolics has been demonstrated. Thus knowledge of which plants in the ecosystem possess these enzymes in their roots should be useful in remediating contaminated sites. 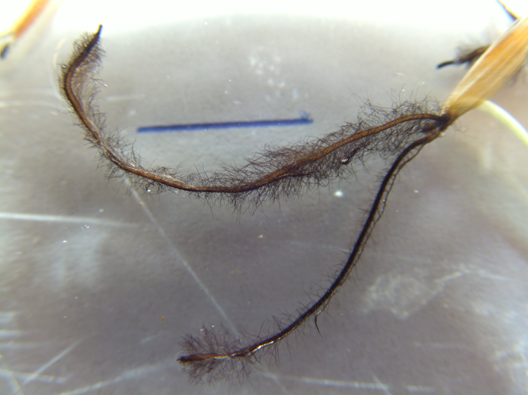 DOPA- stained root hairs and root surface indicate strong phenolase activity in a Smooth Brome (Bromus inermis) seedling (scale line 1 cm). B. inermis a European invader that can form a dense sod which displaces and prevents seed recruitment of native species (photo: D. Kafkewitz).